Which came first, orange or orange? Let me try that again: which came first, the colour or the fruit? It turns out that the fruit came first. Prior to the introduction of oranges to Western Europe in around the 16th or 17th century by Portugese merchants, English-speaking countries referred to the colour by the name ġeolurēad. Say that Old English word out loud and you’ll hear its roots: it’s a combination of the historical versions of the words “yellow” and “red”. Alternatively, people substituted words like “gold” or “amber”: also both words for naturally-occurring substances whose identity is confirmed by their colouration. 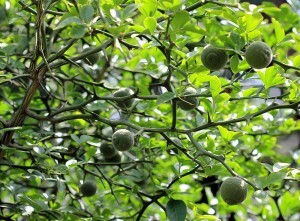 Green oranges. 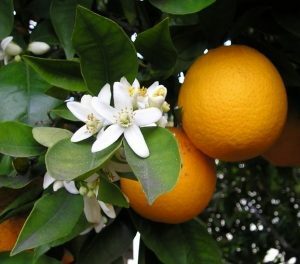 These oranges are what are now known as ‘bitter oranges’, the only variety to grow naturally: the ‘sweet oranges’ you’re used to eating are entirely a domesticated species. 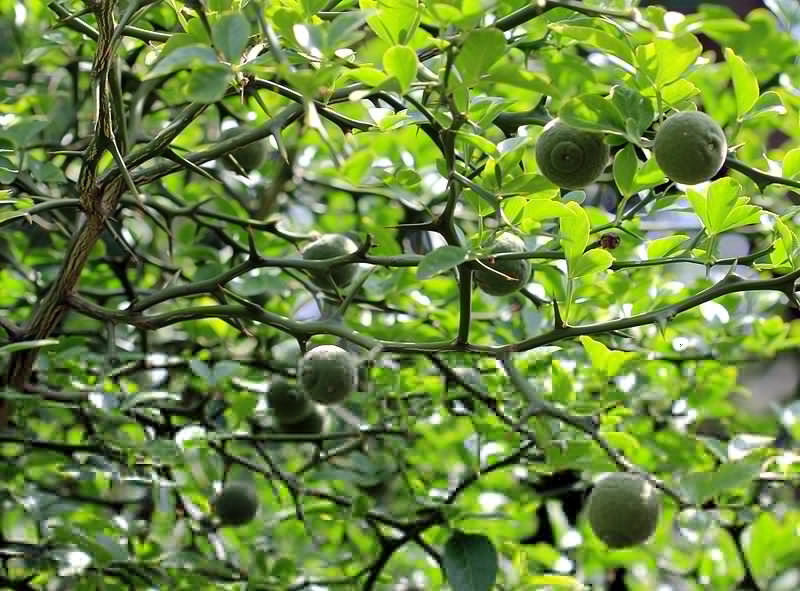 There wasn’t much need for a dedicated word in English to describe the colour, before the introduction of the fruit, because there wasn’t much around of that colour. The colour orange isn’t common in nature: a few fruits, copper-rich soils and rocks, a small number of tropical fish, a handful of flowers… and of course autumn leaves during that brief period before they go brown and are washed away by Britain’s encroaching winter weather. 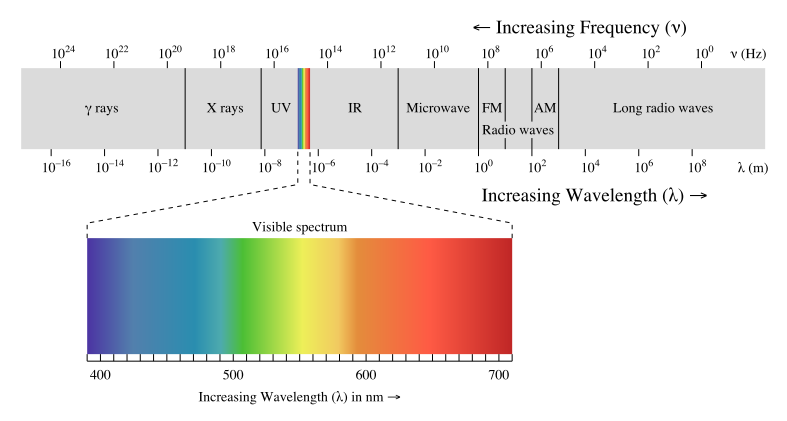 The names for the parts of the visible spectrum are reasonably arbitrary, but primary colours tend to cover a broader “space” than secondary ones; presumably because its easier for humans to distinguish between colours that trigger multiple types of receptors in the eye. Brent Berlin and Paul Kay theorise that the evolution of a language tends towards the introduction of words for particular colours in a strict order: so words to distinguish between green and blue (famously absent in Japanese, Vietnamese, and Thai) are introduced before brown is added, which in term appears before the distinction of pink, orange, and grey. At a basic level, this seems to fit: looking at a variety of languages and their words for different colours, you’ll note that the ‘orange’ column is filled far less-often than the ‘brown’ column, which in turn is filled less-often than the ‘green’ column. 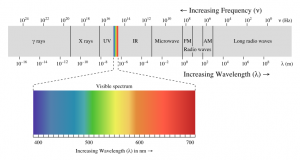 Of course, from a non-anthropocentric perspective, the “visible spectrum” is just a tiny part of the range of frequencies of electromagnetic radiation that we, and other animals, make use of. This is a rather crude analogy, of course, because some languages go further than others in their refinement of a particular area of the spectrum. Greek, for example, breaks down what we would call “blue” into τυρκουάζ (turquoise) and κυανό (azure), and arguably βιολέ (violet), although a Greek-speaker would probably put the latter down as a shade of purple, rather than of blue. It makes sense, I suppose, that languages are expected to develop a name for the colour “red” no later than they do for other colours (other than to differentiate between darkness and lightness) – a lot of important distinctions in biology, food, and safety depend on our ability to communicate about red things! But it seems to me that we’ve still got a way to go, working on our linguistic models of colour. 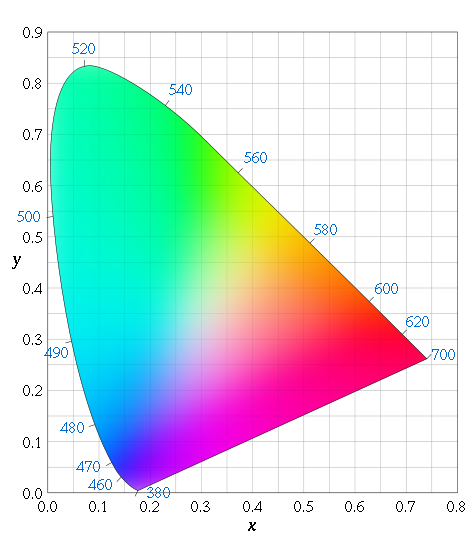 Factor in the ability of the human eye to distinguish between different colours, and you get a far more-complex picture that a simple linear spectrum. 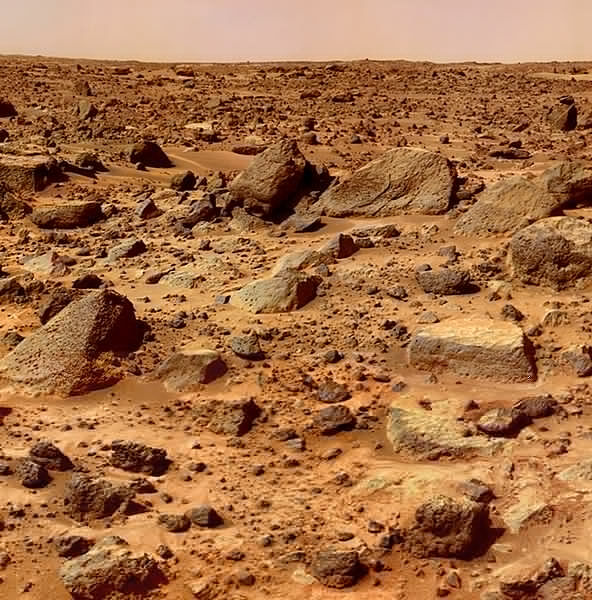 If we’d evolved on Mars (and were still a sighted, communicative, pack creature, but – for some reason – still had a comparable range and resolution of colour vision), our languages would probably contain an enormous variety of words for colours in the 650-750 nanometre wavelengths (the colours that English speakers universally call “red”). Being able to navigate the red planet based on the different ratios of hematites in the rocks, plains, soils and dusts would doubtless mean that the ability to linguistically distinguish between a dark-red feature and a medium-red feature could be of great value! Mars. It’s pretty damn red. The names we have for colours represent a part of our history, and our environment. From an anthropological and linguistic perspective, that’s incredibly interesting. All six colours of the rainbow. No, wait… nine? Three? A hundred? It’s all about how you name them. If it weren’t for the ubiquity of, say, violets and lavender in the Northern hemisphere, perhaps the English language wouldn’t have been for a word for that particular colour, and the rainbow would have six colours instead of seven. And if I’d say, “Richard Of York Gave Battle In…”, nobody would know how to finish the sentence. In other news, I recently switched phone network, and I’m now on Orange (after many years on Vodafone). 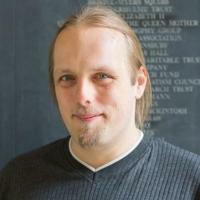 There is no connection between this fact and this blog post; I just thought I’d share.